The recycling industry is constantly changing. With initiatives being implemented regularly towards the goal of zero landfills, recyclers need to ensure their plants have magnetic separation equipment operating at peak performance to maximize the recovery of ferrous metals. Apache’s expertise in recycling ensures our customers have the latest belting innovations for magnetic separation applications. We offer a wide range of rubber base belts providing the needed resistance to abrasion and punctures, specific to the requirements of the application. These belts come with many cleating options including heavy-duty rubber, stainless steel, and high impact plastics. Extremely abusive applications need specialized belts like these, which include wear strips in the center. Material for these strips can range from stainless steel plates to high impact plastics (TIVAR, UHMW, etc.). In appropriate applications, Apache has had great success with the high impact plastics due to the weight of the belt being more manageable for installation. 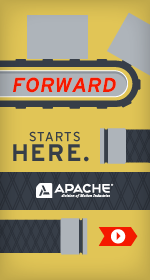 As e-waste becomes more prevalent, Apache has applied unique solutions for applications requiring lighter weight belting, while maintaining maximum recovery rates. Contact the experts at Apache for solutions that maximize separation requirements and maximize recovery rates!